Due to the quality of the bassets we breed and our efforts to show them in AKC Conformation Shows in the Bred by Exhibitor Class we have been awarded this medallion by AKC. The American Kennel Club is pleased to award a Special Bred-By Medallion to the Breeders, Don & Pam Bullock and Heather Simonek. Bred-By-Exhibitor medallions were awarded to these exhibitors for completing all points required for their conformation championship title by advancing to the winners competition from the Bred-by-Exhibitor class. 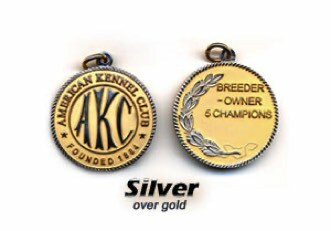 These Special Medallions are in recognition of each individual's valuable contribution to the sport of purebred dogs, who as the breeder-owner-handler of five different dogs that have become champions of record and received an original Bred-By Medallion through their participation in AKC Events. We recognize each for their successful participation and for their continued dedication to the different AKC Sports for purebred dogs. We wish each of them much success in future AKC Events. Don and Pam are very proud of this accomplishment. It is an indication of their dedication to basset hounds and the AKC Standard for Basset Hounds. Those looking for puppies need to understand that not all breeders use the AKC Standard as a model for their breeding nor do they concentrate on the quality of the dogs they breed. Don & Pam proudly show their dogs in the Bred by Exhibitor Class. This means that their bassets were shown in this class as puppies as well as when they were adults. All received some of their points before becoming adults and a few even finished their AKC Championships before becoming an adult. They are the dogs that Don & Pam breed to produce their next generation for the show ring and to sell to families as pets.